When spending your money on an advertising campaign, you want it to reach the right people at the right time. Fairway’s new mobile billboard positions your message at eye level, when and where it will be most effective. Serving North and South Carolina, Fairway’s mobile billboard gives you access to areas traditional advertising does not. They deliver your message at key locations such as malls and shopping centers, adjacent to trade shows, convention centers, sporting arenas and other heavily trafficked areas where your target audience works, shops and plays. Maximum Exposure: Our double-sided, full-color, backlit displays are on view 24/7 exactly where you need them. Custom Routes: Mobile billboards provide the ability to design custom routes that enable your advertising campaign to target specific locations at critical times to maximize your exposure opportunities. GPS Tracking: We can verify the location, speed, direction and status of our mobile billboards using the onboard satellite-based Global Positioning System. Flexible Scheduling: Daily, weekly, monthly or longer-term contract periods are available. Standard Size:: The standard size allows art designed for your mobile billboard to be utilized on traditional billboards without the time and expense of reformatting. Event marketing: Create excitement and awareness of your special events: sporting event, state or county fair, auto, boat, or horse shows or even the New Year’s Parade. New product introductions: Add power and excitement to your overall strategy at the point of sale. Do on-site product sampling or distribution of literature at the mall or practically anywhere. Trade shows: Increase your booth traffic by placing your message around the airport, host hotels, convention centers and high traffic routes to popular restaurants. Grand openings: Create rapid local awareness in and around your new location. Make your business an instant success by maximizing your opening day sales. Test Marketing: Maximize awareness of your product or service by targeting specific business, ethnic and geographical areas. 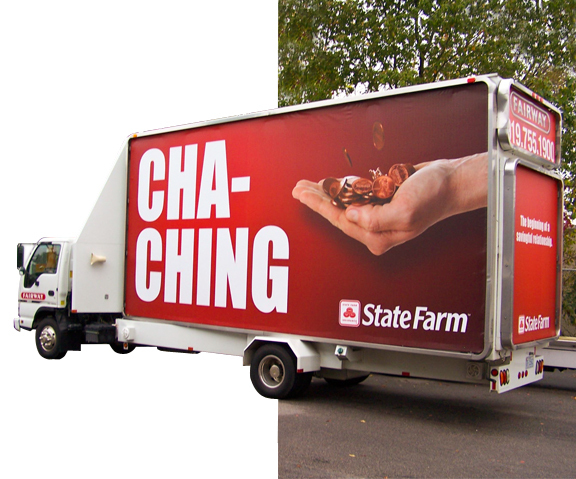 Mobile billboards offers you the flexibility to change designs rapidly so different messages can be tested in different locations. Political Advertising: Take your candidate to the voters or drive your editorial to the ”Hill.” With mobile billboards your voice will be heard and remembered. Fairway’s more driven than the competition. Call Lisa Rondina 919-755-1900 and find out how. Download a viewable and printable Acrobat PDF product sheet of our Mobile Billboard or download our templates here.